Have you ever had to rely on a beat up and poorly working hotel supplied hair dryer to dry and style your hair in the morning? It can be a terribly frustrating way to start your day for sure. That is why owning the best travel hair dryer you can buy is a smart thing to do. When you own your own travel hair dryer you will always have a hair dryer with you that works great every place you go. In this article, we will do some travel hair dryer reviews of the top rated models available in the beauty marketplace. I will also give you some helpful buying information you can use when shopping for one. By the time you are finished reading you will know exactly how to go about purchasing the perfect travel hair dryer for your needs. Size truly does matter and its small size that counts when it comes to any travel hair dryer that you will buy. The T3 Micro Featherweight Travel Dryer only measures a slight 7.1” x 3.1” x 9.1” when folded. This hair dryer from T3 has really got you covered when it comes to power too. It features 1200 watts of power which enough to supply you with plenty of heat and airflow when you go to use it. Among its other fine features are its tourmaline plus ceramic technology, 2 heat /2-speed settings, and its dual voltage capability. I really thought this travel hair dryer was impressive and T3 backs it up with a good 2-year warranty also. The designers at Sam Villa sure got it right with this compact and lightweight travel dryer. It measures only 9.8” x 10” x 3.9” and weighs a scant 15 ounces too. You don’t find too many hair dryers that are as portable as that. It’s small but mighty to with its 1750 watts of drying power. That is plenty of heat and airflow to tame even the toughest type of hair as you blow it dry and style it. This travel dryer also gives you 3 heat settings and 2-speed settings to choose from as you use it. Also built into this hair dryer that’s easy to take on the go with you is ceramic heat/tourmaline negative ion generation. This enables you to blow dry your hair without damaging it and also helps you give it some extra shine. 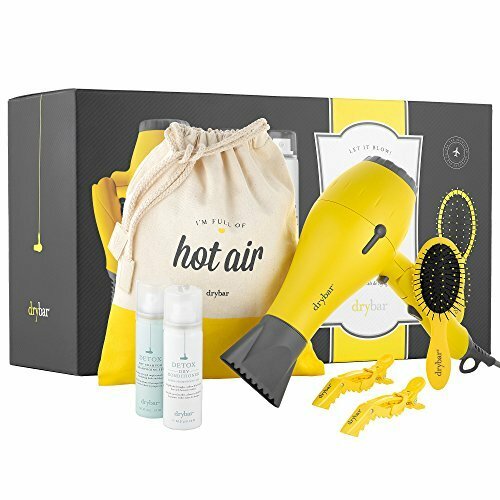 Featured in this nicely put together hair styling travel kit is the Baby Buttercup Blow Dryer. It’s a compact and powerful unit for a hair dryer that was designed to travel with you anywhere you go in the world. It has such great features as a very generous 1875 watts of power that can be plugged into any 115V or 230V outlet thanks to its dual voltage capability. This nice drying tool also weighs only 14 ounces and is easy to pack in even the smallest size luggage thanks to its 9″ x 8″ x 3″ dimensions. Drybar gives you when you purchase it. BaBylissPRO is a big name in hair styling products and they don’t let you down with this travel hair dryer. When you fold this blow dryer’s handle up it packs easily because it then only measures 5.5 x 2.5 x 7.9 inches. That’s so small it can even be packed in a large size purse. The manufacturer did not skimp on the power this travel hair dryer has either despite its small size. It still has 1000 watts of power to generate its heat and air flow. You also have 2 heat and 2 airspeed settings to choose from when you use it. Best of all this BaBylissPRO hair dryer uses their very efficient Nano Titanium technology. 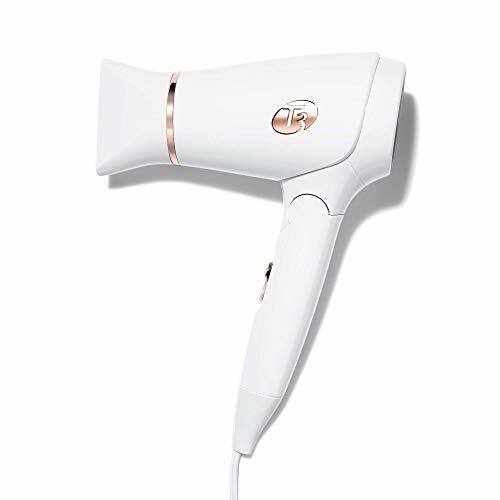 This hair dryer heats up fast when you go to use it and produces gentle heat that leaves a frizz-free shine to your hair. The dryer that comes in this unique travel set is more than adequate to take care of your hair drying needs as you move from place to place. 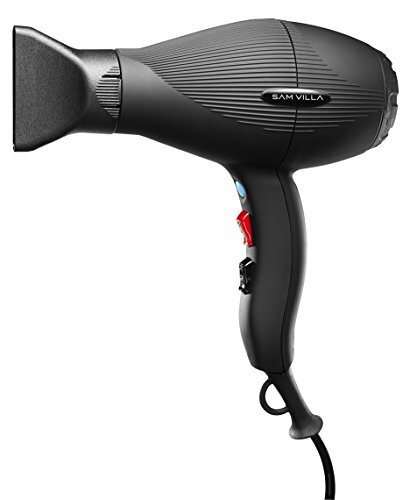 Its decent sized motor generates 1000 watts of power to produce the heat and air flow that you will dry your hair with. When you use it you will also have your choice of 2 heat settings and 2 airflow speeds. 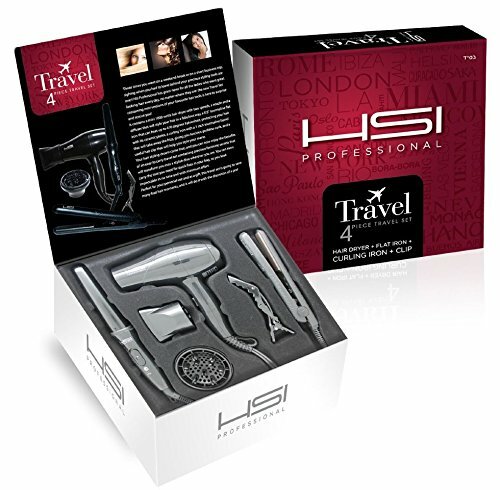 The HSI Professional Travel Set Hair Dryer also includes premium ceramic inner coatings in combination with an infrared heat source. This produces gentle, even heat that helps dry your hair quickly without damaging it. Rounding this hair dryer out is its nice dual voltage capability and the kit it comes in has many other helpful styling tools also. This is really a travel dryer that has all the bases covered when it comes to what you want in one. For one, it features 1875 watts of air flow and heat power. That is as much as just about any full-size hair dryer. This Osensia travel dryer also lets you choose between 3 heat settings and 2 airspeed settings. This hair drying tool is also easy on your hair and will help eliminate frizz and split ends. This is due to the fact that it has advanced ceramic/tourmaline coatings on its inner working parts. 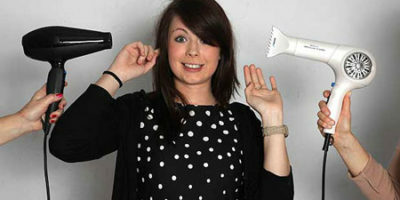 Hair Dryer measures only 9x10x4 inches and weighs less than one pound. That is pretty incredible for the amount of power and as many great features as it has. You may love your full-size hair dryer but if you want to take it with you when you travel it might take up half of your suitcase. Size is so important in any hair dryer that you want to take with you as you go to different place. The smaller the hair dryer the easier it is to pack around and the more places you can conveniently take that travel hair dryer with you. It does not matter if you have a really small hair dryer that is easy to pack if it weighs as much as a bowling ball. Believe it or not, some compact hair dryers can be very heavy due to the motors that power them. So make sure you are aware of the weight of any travel hair dryer that you are thinking about purchasing. The weight of each model is usually listed on the packaging or you should be able to look it up on the manufacturer’s website. To be blunt, some travel hair dryers are nice and compact but they are also woefully underpowered. It does not do you much good to take a hair dryer with you as you travel that really does not work that well. You should be looking to buy a hair driver that you can use on the go that has at least 1000 watts of power at the minimum. That is enough to generate some serious heat and airflow. Some companies manufacture their travel hair dryers with features or add-ons that make them much more portable. A good example of this is a folding handle that enables that hair dryer to take up even less space when packed. Some companies will even have small pieces of such things as the barrel that can be dismantled for travel. 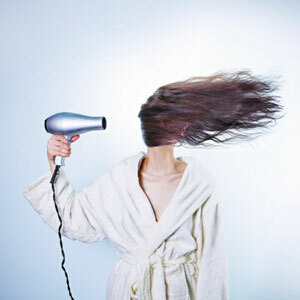 Frizz, split ends and dull hair are all problems that can arise if you use a poorly designed blow dryer on your hair. Static electricity can also greatly inhibit your ability to style your hair. A blow dryer that creates negative ions as it works tends to counter all of these things. That is why internal coatings that promote negative ion generation are nice to have in any travel blow dryer that you purchase. Professional stylists adjust the speed and airflow settings on their hair dryers to meet the needs of each individual’s type of hair. That is the very reason that you should purchase a portable hair dryer with multiple speed and temperature choices. You can then experiment and find the perfect combination of these settings that lets you dry and style your hair quickly and easily. You have to pay attention to the voltage of any hair dryer that you will use when you travel also. Travel hair dryers either come in 115V versions for use in the USA and North America, 230V versions for use in other places and dual voltage versions that can be used just about anywhere. So you have to match the voltage to the different countries you will be traveling in. Many salon professionals will not even consider owning a hair dryer that does not have a cool shot button. These handy buttons stop the flow of warm air for a brief second so hair can be set in place as it’s quickly cooled. It is amazing how many travel dryer manufacturers do not include a travel bag with their products. These not only make the hair dryer easier to take with you but they also help protect it as you travel to your next destination. Some travel hair dryers can cost well over one hundred dollars. That is not the type of item you want to simply throw away because of a part or structure failure. The more you pay for a travel hair dryer the more important the warranty becomes. Try to buy a hair dryer that you take with you on your travels that has as long and comprehensive a warranty as you can find. Most people don’t have enough space for the clothes and other things they will bring with them when they travel let alone have enough room for a big hair dryer. A specially made travel hair dryer is usually much smaller than a standard hair dryer so they take up much less room when packing. This is a big advantage when it comes time for you to pack for your trip. Some hair dryers that are made for travel can even be made smaller after use by means of a foldup handle. These will take up even less room in the bags that you pack. Hair dryers have electric motors and the bigger they are the heavier they will be. Manufacturers of hair dryers made for travel realize this and make every effort to keep the weight of their dryers down. That is why travel dryers are often much easier to tote around when they are in your luggage. Not only does a travel dryer help keep the weight of your luggage down but because they are lighter in weight you can use them longer without your arms getting tired. This is why some salon professionals go out of their way to find a travel hair dryer to use for their work. What is dual voltage capability? We mentioned that hair dryers can be made to work with 115V electricity, 230V electricity or both. The latter is what is known as a dual voltage hair dryer. It will work in just about any outlet found anywhere in the world (most likely you will need a plug adapter for different countries). Why is dual voltage capability important? Well its not if you only travel in the USA because you will only need to use 115-volt electricity. When it makes a big difference is if you will travel in both the USA and overseas. If you do not have a dual voltage hair dryer you will need to have a separate hair dryers for North American countries and all the other countries with different electrical currents. One other nice thing about hair dryers that are specifically made to take places with you is that they often come in handy hair styling kits. In these kits, you will often see such items included as travel bags, hair clips, dryer attachments, flat irons and even mini curling irons. These you can sometimes really get a good deal on price wise too. Question: if I buy a dual voltage travel hair dryer does that mean it will plug into any outlet anywhere in the world? Answer: The answer to this question is both yes and no. A dual voltage capable travel dryer means it can run off of 115-volt electricity like is found in the USA, Canada, and Mexico or it can run off of the 230-volt electricity that is found throughout the rest of the world. The wildcard is the shape of the outlet that you will plug it into. Chances are in most countries you will need an adapter to convert an American type 3-prong plug to match the configuration of the outlet in the new country you are visiting. Question: Which is better, a travel hair dryer whose handle folds or one that does not have a folding handle? Answer: Whether a handle folds are not really does not have anything to do with the quality of that travel dryer. 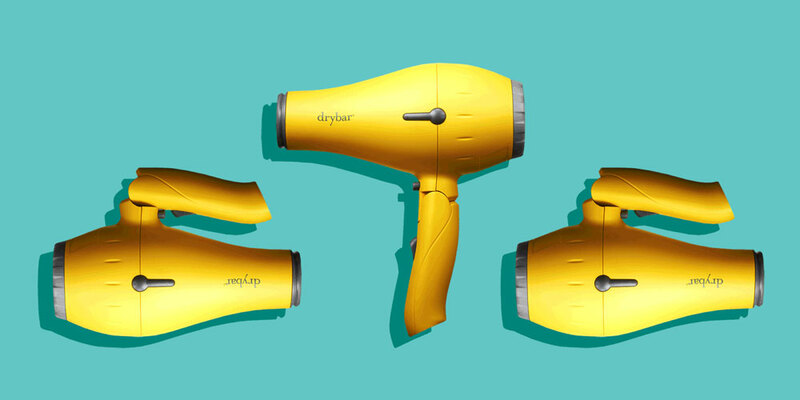 There are excellent hair dryers made for travel that have both folding or non-folding handles.it all depends on what features the manufacturer decides to build into them. Be careful about one thing. You sure don’t want a travel hair dryer with a cheaply made folding handle that feels like it will easily break. If you like to blow dry your hair and style it each day and you also travel you seriously want to consider purchasing your own compact and lightweight travel dryer to take with you. It’s just so convenient to use a dryer on your hair every day that you are familiar with the settings it takes to give your hair the look you want. Manufacturers of travel hair dryers put a lot of features in them that make them almost as good these days as their full-size counterparts. The best travel hair dryer will still enable you to dry and style your hair quickly every day. 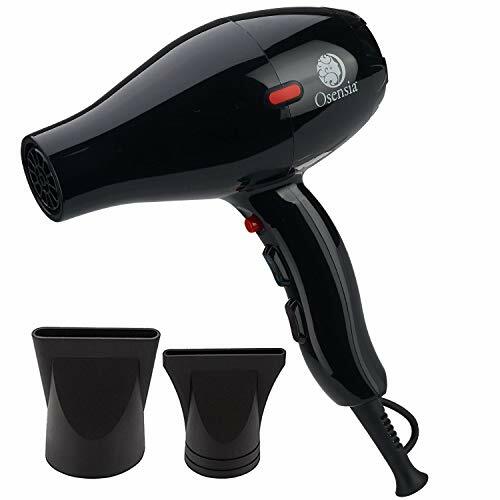 When you are shopping for a new hair dryer to take with you when you are on the go make sure you refer to the travel hair dryer reviews we did in this article and the other advice we gave you here too. If you do that you will have no problem finding a handy travel dryer that will easily meet your needs as you go from place to place. 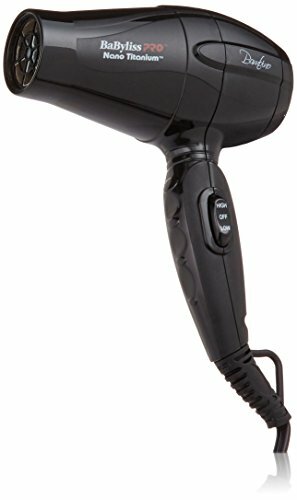 Best-Selling Travel Hair Dryer Reviews!